Purchase your copy. Read the Introduction online. Learn more. The reviews are coming in for Cultural Heritage Collaborators! Melissa has brought together a great deal of the professional literature from the library, museum, and archives worlds toward the goal of more thorough and systematic documentation of local communities. I enjoyed her straight forward writing style throughout. The case studies are especially engaging as she clearly explains the key elements of success (or failure) in each of the local stories. Collaboration and collection development planning are hard work. I hope her volume will inspire others to make that investment on behalf of the future." Melissa Mannon's book, Cultural Heritage Collaborators: A Manual for Community Documentation, begins with a surprising premise - surprising, at least, for a non-archivist. Archives, she contends, forms the foundation for our society and civilization and thus, should provide the basis for community partnerships amongst cultural organizations. To think this way is likely nothing new to those who prize the written-record as the preeminent trait of authentic culture and personal heritage, but this book goes beyond the pats-on-the-back that deeply-entrenched professionals too often engage in. Rather, she provides a spirited manifesto for how and why those in the record collecting business can reframe their centrality in the process of community-building, especially within professions that too-often remain in different camps. In short order Mannon argues a convincing case for the centrality of archival records for the public good; offers clear, direct, and helpful community-based examples that feel more like customizable templates rather than absolute prescripts; and, uplifts both the committed professional and the dedicated amateur alike. Her definitions of the related, but distinct, concepts of collaboration, cooperation, coordination, and partnership are especially instructive and delivered in clear-cut suggestions with an eye towards moving individuals and organizations towards strategic-thinking in collections development. Whether desirous of obtaining a sense of the philosophical foundations, historical understanding, practical methods, or real-life snapshots of archives at work within communities, any professional working in the world of community-building through heritage and cultural resources could find something of value here. This book is a practical guide not only on how to create, organize, and maintain an Archives but also-and more importantly-how to preserve our future through collaboration between local historical groups, businesses, and government agencies. Understanding that this is not a task to be taken on by a singular group, that it is an ongoing process rather than one set in stone and antiquity, and that it can be successful no matter what size group is undertaking the work, are the basic tenets of Mannon's book. Cultural Heritage Collaborators is a must-have guide for any group working with any sort of historical documents. Whether you are familiar with best practices and institutional standards or not, this book puts things into perspective as to how documents should be managed amongst collaborative local groups. For those who aren't that knowledgeable on how to maintain our cultural heritage, or how to develop community relations to strengthen efforts of preservation, this book will definitely help get you off on the right foot. Mannon's work is not only inspiring and informative, but it truly conveys her enthusiasm toward documenting cultural heritage and the importance of preserving our collective past. It shows us all that there are feasible steps to take in organizing and caring for historical documents for future generations to cherish and use as tools to uncover the cultural past. 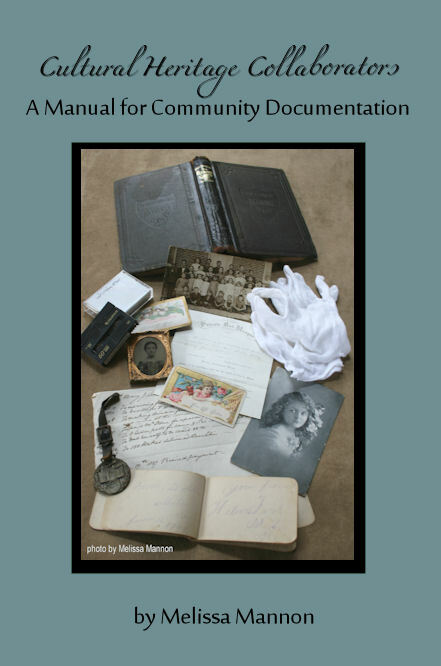 Whether a self-taught historian or professionally trained archivist, this book holds great value for any audience who searches to collaborate with their neighbors to document any aspect of a community. Collaboration as a concept is not new. We've seen it successfully working with groups, businesses, and people. But when it comes to protecting the archival portion of our cultural heritage, collaboration is not necessarily the first thought that comes to mind. Whether this stems from territorialism, fear of the process, or simply it never came up, collaboration in the archival arena may actually be the answer to saving these precious materials. Cultural Heritage Collaborators has come out at a critical time in our country's history. Economic crises have forced the closure of museums and libraries and their archives, as well as businesses that also have archival materials. With an eye to the future, Ms. Mannon's manual provides clear steps that any group can follow to collaboratively collect, protect, maintain, and expand archives that are important to a community's history as well to our country's. Not merely laden with theory, Cultural Heritage Collaborators contains real examples of collaborative efforts to save archival materials that are working. While there is no "right" way to be successful in the collaborative process, the steps on why and how to start, the cautions, index, and bibliography are important elements in this easy to read manual that can insure success. As someone who spends many hours using the materials found in archives and discovering small collections that really need proper care and maintenance, this book provides the much needed information to protect their future. Truly it will take a village of diverse individuals and groups to appreciate and undertake the protection of its archives. But future generations will understand and benefit from the effort if we use Cultural Heritage Collaboration as the foundation for demonstrating our responsibility in protecting this sometimes under valued part of a community's history.